At the end of World War II Germany was in ruins. Over two-thirds of Bayreuth had been destroyed, and hordes of refugees from the East were streaming into the small town. By some miracle, the Festspielhaus was one of the few public buildings not destroyed by the bombing. The American occupying forces began using it for religious services as well as for shows to entertain the troops. By 1946, it was fairly clear that the Wagner Festival should be revived, but how? The whole enterprise was bankrupt, the theater was in need of repair, and the majority of the costumes and sets had been destroyed, or were in storage in a salt mine, beyond reach, in the Russian zone. Wagner's operas, filled with the spirit of German nationalism, had been turned into weapons of propaganda by the Third Reich. Hitler had been a personal friend of the Wagner family, and he had attended the Festival many times. In the postwar years, the Allied denazification laws had categorized Wagner's daughter-in-law and heir to the festival, Winifred, as a "major Nazi offender." In order for the Festival to be resurrected into a new era, Winifred turned the theater and the Festival's assets to her sons, Wieland and Wolfgang. 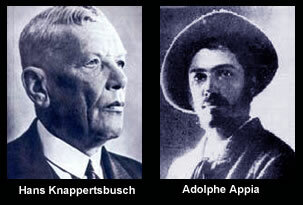 The brothers agreed on a division of labor according to their strengths: Wolfgang was responsible for the financial side, and Wieland for the artistic. 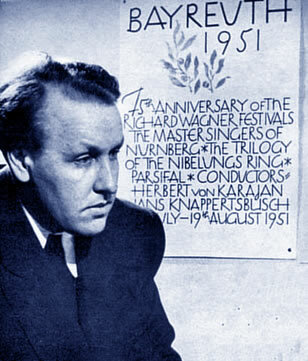 Wieland announced that the Festival would open in 1951 with a performance of Parsifal. To assure that the Festival would start with a firm hand and on a high artistic level, he selected Hans Knappertsbusch and Herbert von Karajan to conduct the newly formed orchestra. At the recommendation of Karajan, Wieland appointed Wilhelm Pitz to the post of chorus master. The best singers available were chosen, for the leading roles. They included Astrid Varnay, Hermann Uhde, Wolfgang Windgassen, Ludwig Weber and Canadian Bass-baritone George London. Now, one last task needed to be accomplished and one question lingered in Wieland's mind: what would these operas look like? How could he design a production of Parsifal that would free it from all past associations with Nazi German nationalism and the incriminating links to the nightmare that the country had lived through? What he came up with stunned audiences. July 30, 1951, the first performance of Parsifal and the re-opening of the Festival, marked the beginning of a new style which would later earn the title of "New Bayreuth." 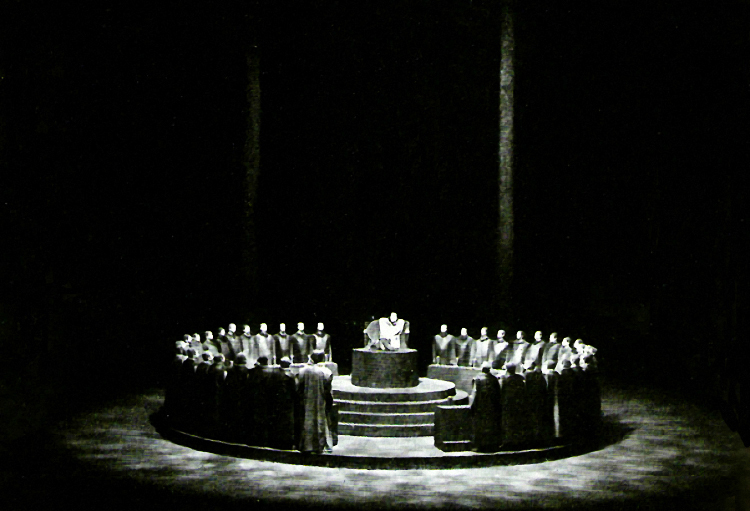 Above: Hans Knappertsbusch led the 1951 performances of Parsifal. The stage designs and theories of designer Adolphe Appia influenced Wieland Wagner's design for this production. 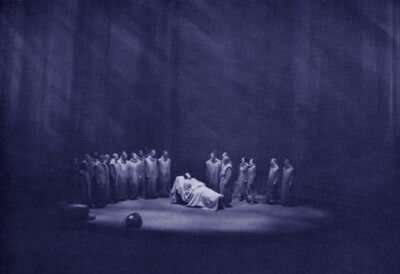 Right: A photograph of the 1951 production of Parsifal featuring Wieland's stark design for the first scene of Act One. The Parsifal Cross ( Das Parsifalkreuz: Ein psychologisches Schema) as it appeared in the Bayreuth Festival Book for 1951, pages 68-69. "True to his intentions, Wieland approached Parsifal through an analytic scenario which he set out as "Parsifal's Cross: A Psychological Pattern" [see diagram above]. This was a diagram showing how the opera's events moved towards and then away from the peripeteia [turning point] of Kundry's kiss, and were symmetrically related to each other. But what struck most visitors in 1951 was not the psychology of the production but its mystic spiritual aura. In the dim, soft light the eye had to search for the barest intimations of place -- four dull-gold vertical brushstrokes indicating the pillars of the Grail temple, a spider's web tracery for Klingsor's domain -- and for the shadowy forms of the singers. The work had been transformed into a dream play. In Tradition and Innovation Wieland explained that the staging of Parsifal required mystical expression of a very complex state of the soul, rooted in the unreal, grasped only by intuition, and that this was what he provided. The impact of the production was as well described by its enemies as by its friends: a symphony in gloom, a formless play of patterns and shadows which dispenses with individual dramatic relationships, confines itself exclusively to symbols and thereby becomes wearisome. Those in the other camp, such as Ernest Newman, would not have faulted the description, insisting only that the whole effect was not 'wearisome' but 'magical'." What Wieland Wagner accomplished was a revolution and a revelation. His stage design completely shattered preconceived artistic notions and over one hundred years of traditional staging orthodoxy. After this groundbreaking production, Wagner's works would never again be presented in the same manner. His brilliant concept completely did away with Wagner's stage directions and scenic suggestions, and instead presented Parsifal as a stark, symbolic piece with costumes that reminded audiences more of Hellenic Greece than Teutonic medieval myth. The sets paid homage to the early twentieth century scenic experiments of visionary designer Adolphe Appia. As a result of this bold achievement, the unfortunate series of events that had linked Wagner's work to the Third Reich were completely destroyed. 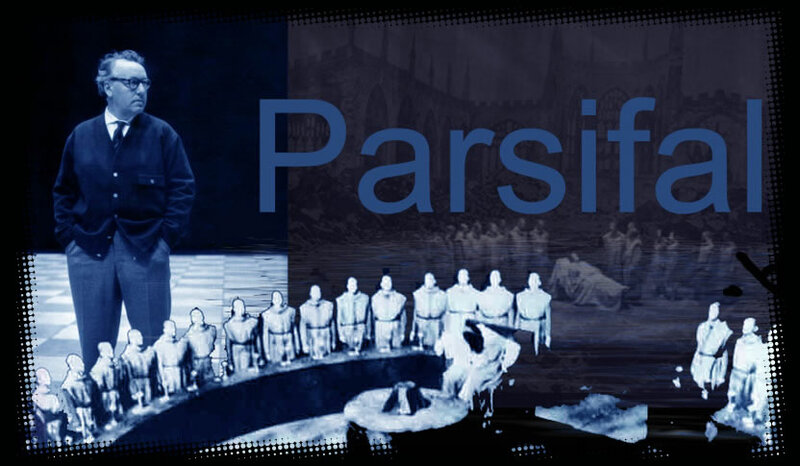 The 1951 Parsifal would become one of the most important opera productions in the twentieth century . As the first production of "New Bayreuth," as the style came to be known, this Parsifal originated many of the stylistic trademarks that would come to define Wieland's work. There was the inventive and effective use of light and darkness, the stark simplification of costumes, the reduction of setting to a minimalist level, the transformation of the characters into symbolic manifestations of themselves, and finally, and perhaps most important of all for 1951, the "denazification" of the operas by removing anything "German" in the visual plane of the work.